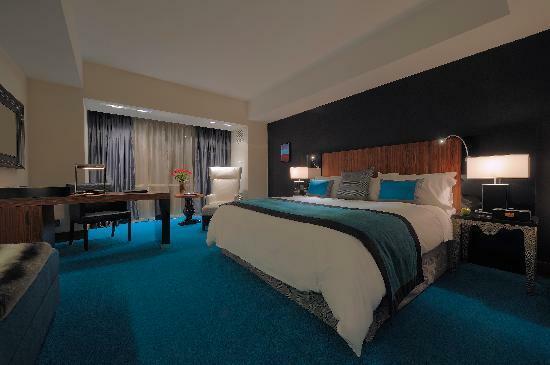 Radisson Blu is a familiar hotel brand to us in Scandinavia but the company has only recently opened its first US property which they chose to locate in Chicago. My three nights in the Windy City seemed like a good opportunity to check out how they were approaching the American market. I guess the chance of staying in a luxury hotel less than six months old must have been quite tempting too? It was. Not only is the hotel centrally located in Chicago but the building itself is a local landmark; indeed its rather unique ‘wavy’ design is highlighted on the river trips run by the Chicago Architecture Foundation. Trivia fans take note: this is the tallest building in the world to have a woman as lead architect. So what were your accommodation criteria? Knowing that decent hotels in Chicago were going to be pricey, I was trying to find somewhere under US$200 a night. Note that as in many US cities Chicago imposes a state tax and a city tax on hotel stays – together this will add 16.4% onto your bill. I left this out as it’s usually payable on departure and not included in quoted rates. Being walking distance from ‘the bean’ and some Batman locations was a nice plus in addition to the aforementioned central position. Four stars. Opened November 2011. 346 rooms over 17 floors. The hotel is located a couple of blocks south of the river and a few blocks west of Lake Michigan. Millenium Park is at the end of the road and the nearest L-train stop can be reached in 10-15 minutes. The surrounding area contains offices and plenty of other hotels. If you come across a taxi driver who does not know where it is ask for the more established Fairmont Chicago hotel which is right over the street. Should you be driving you can choose between self parking in the garage under the hotel or valet parking. Neither comes cheap – US$43 and US$53 respectively. 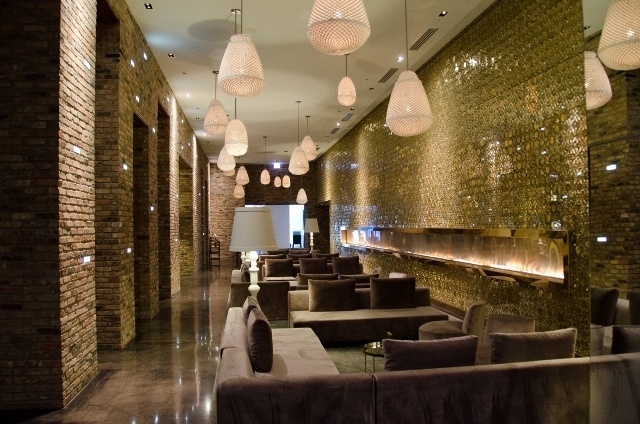 It’s new, it’s very funky (check the lobby area below with its wall of fire) and it’s well-located. There are two pools and the rooms are well appointed. If you can’t quite run to the Trump International or the Intercontinental then you can still get a taste of luxury here. Make sure you book as far in advance as possible and watch out for good deals – the price I paid was far below that offered on other sites and was booked through the hotel’s own homepage. Also, if you like to go green this is a perfect choice – the hotel is run according to environmentally-sound principles and has been Green Key Gold Certified. All the wood in the furniture comes from sustainable forest sources and hotel cleaning is carried out using an ‘Ionator’ which doesn’t use any chemicals. Breakfast is of course organic. There are essentially three different types of room – City and Park View, Business Class and Suites. There are a range of different suites including one type aimed at families. You can request a discount upgrade on booking and if you’re lucky will pay a minimal charge to move up the ranks. I wasn’t lucky, but was very satisfied with my City View corner room, which was large, light and airy with a modern feel. The room had the following features: flat screen LED television with the usual mass of cable channels, writing desk with chair, private safe big enough for a laptop, telephone, iron & ironing board, blackout curtains, non-opening windows (which I don’t like but probably has to do with health and safety legislation), a fancy coffee machine, radio with iPad dock. And a great bed. Yes, this is the US after all so carpets are the norm. Mine was scrupulously clean so thumbs up there. 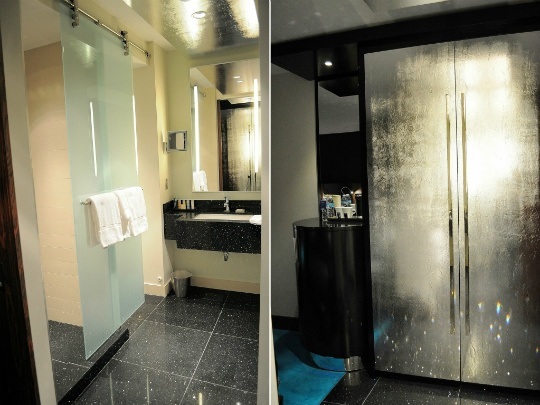 The bathroom was large, modern and practical with a double shower, separate toilet and washbasin. Nice Anne Semonin toiletries. Hair dryer provided. Yes, free and fast. No complaints here. Yes both – the bar was very popular with office workers at lunchtime and there is an Italian restaurant which I have read good things about, but did not try myself. Here the Aqua has you covered. There is a gorgeous outdoor pool (sadly closed when I visited as it wasn’t quite warm enough outside) on the third level which is a huge landscaped park with a running track. Fortunately there is also an indoor ‘lap’ pool which is thin and made for ploughing up and down. Strangely enough I couldn’t find a changing room but the lifts nearby can whisk you to and from your floor without having to go through public areas or you can change under a towel poolside I suppose. A gym, steam room and sauna are also available. Actually no, breakfast was not included in my rate (which is unusual for a Radisson in Europe but more common in the US) but is available in the restaurant or in your room. Excellent service from check-in to check-out; the concierge had excellent local knowledge and staff were helpful in obtaining taxis etc. Yes, you can earn Club Carlson points here (indeed I happened to be here during a 3x promotion so earned loads…). You can also use your points for your stay or combine points and cash. Not much information was provided but given how new the building is I would assume it meets all environmental standards. Radisson has a generally good record in this area in Europe but until I hear back from the hotel I am hesitant to rate this aspect of the hotel. Rates start around US$194 plus taxes. Shop around for advance deals – as usual if you are happy to pay fully in advance you will always save more. Well-designed and comfortable rooms with a fab bed, superb fitness and leisure facilities. Good location. Plenty of power sockets. No smoking. Excellent service. Well-stocked mini bar. I always think they could throw in breakfast for this kind of price but Chicago has plenty to offer here so I’ll not be docking points for this. 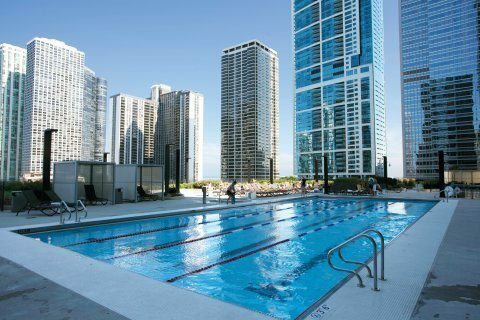 I can’t think of anything truly negative to say about the Aqua; I had a great time and would wholeheartedly recommend this hotel to anyone visiting Chicago. 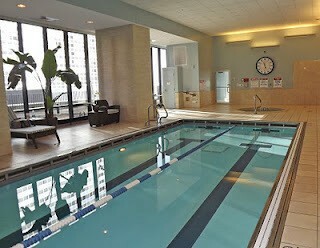 I doubt it gets much better for the price in Chicago – there’s nothing missing at the Radisson and more facilities than you’d expect. If you get a good rate don’t hesitate to book. Please note: The author travelled as a regular tourist – no mention was made of the fact that a review would be written, the establishment was not informed of the author’s intentions and no special discounts were enjoyed. This is a vital part of our aim to provide impartial and comprehensive advice.